Emanuel Xavier is an American poet, spoken word artist, author, editor, literary events curator, and actor born and raised in the Bushwick area of Brooklyn. 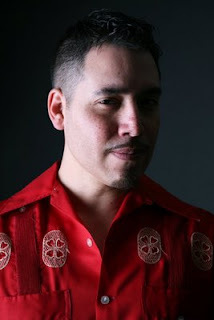 He is one of the most significant voices to emerge from the neo-Nuyorican poetry movement using political, sexual and religious themes throughout his work. His background is Puerto Rican and Ecuadorian. He has been featured on television on Russell Simmons Presents Def Poetry on HBO, In The Life on PBS He performs regularly throughout the United States as a spoken word artist and internationally in cities such as Buenos Aires (Argentina), Guayaquil (Ecuador), and Ghent (Belgium). This interview was conducted in June 2009. Jory Mickelson: From the outset, some of my readers might not know the difference between standard poetry and spoken word. Could you tell us more about that since you distinguish yourself as both a poet and spoken word artist in your bio? Would you say that spoken word differs from performance poetry or is it the same thing? Emanuel Xavier: Performance poetry involves poems that are specifically written to be performed aloud with or without music but always using theatrical elements and has been around since the Beat generation. Spoken word evolved in the United States in the late ‘80’s with poetry slams where poets face off in cabaret-style duals but it was a popular competitive event in India for centuries. Spoken word is a broad term that covers everything from the reading of a children’s book to a monologue. Both performance poetry and spoken word poetry usually involves work that is more political and has a tone of protest, which appeals more to high school and college students. They are both different poetic styles than say Shakespeare but I could easily imagine Walt Whitman sitting in the audience at a poetry slam. Whether you choose music or metaphors, it is all about expressing yourself creatively. I suppose I am listed as both a traditional poet and a spoken word artist because I write for both the page and the stage. JM: In 1997, spoken word must have felt more ephemeral than it does today with the internet, YouTube and digital media. What do you feel that digital media has done for spoken word? Where do you think technology will take the arts in the future? EM: Digital media has done a lot for spoken word poetry. In order to get our work out there as spoken word artists, we no longer just depend on bookings and gigs to reach an audience. Besides print publications, people around the world could watch us perform one of our poems on YouTube or read one of them on the internet. I think the future holds exciting possibilities for being able to reach the masses. JM: You self published your first book of poetry, Pier Queen , in 1997. Would you say that self-publishing was a good thing for you? Would you recommend that other poets and spoken word artists self publish, or should they seek more traditional publishing outlets for their work? EM: I really enjoyed self-publishing my first book because I learned a lot about the business. I am sort of a control freak by nature so it was a great way of getting my foot in the door. I would absolutely encourage it for the experience but, at the end of the day, it is ideal to seek a publisher. It is nice as artists to be able to focus on our art and leave all that boring stuff like distribution and such to the professionals. Self-publishing has its rewards and it is a great way to start but, unless you are looking to go into the publishing industry, collaborating with others to put a book out is also a great experience. It is hard enough trying to write a poem or a novel without having to think about getting the ISBN number or getting it on bookshelves. JM: Your first novel, Christ Like was first published back in 1999. Can you tell me a bit about how you went about writing it? Some of Mikey’s life seems to mirror your own. Would you say that this book is largely autobiographical or something else? EM: I started writing the novel when I was 25 years old. At that point, I realized I would either crash and burn or do something with my life. I packed my bags and went down to South America during the Fall. My uncle owned a beach house in Salinas in Ecuador and it was off-season. I was in complete isolation for several weeks. I was either going to go mad or emerge with a rough draft manuscript. I was determined to write this book and leave something behind so that a quarter century of the insanity of my life had not been in vain. In the tenth anniversary revised edition which just came out, in the introduction, I admit that the few changes which had been made make this more of an autobiography but it still warrants the title of a fiction novel. JM: How did it feel to be nominated for a Lambda Literary Award for your first book? EM: It was an interesting time. I was dealing with some harsh negative reviews setting me up against established writers who were also college professors and I had just found out Painted Leaf Press, which published the original, was filing for bankruptcy, and going out of business. The book was pretty much dead on arrival and so I did not get to truly appreciate the fact it was a finalist for a Lambda Literary Award. Even if it was in a small category, the fact that the queer literary community was validating my humble beginnings as an author should have been something to celebrate. Unfortunately, my history preceded me and I was still doubting whether I could actually make this transition or not. It is always easier to believe the negative things people say about you than the positive things. JM: Christ Like is being reissued after ten years. What was it like to revisit your novel a decade later? What kind of revisions did you make? Was there anything that surprised you during the process? EM: I was surprised at how much editing it needed and still I did not perfect it. I tried not to mess with it too much even if it meant it would remain amateurish because the writing reflects the main character and this was his story so it needed to be genuine. I went crazy with the footnotes probably because I wanted to reach a wider audience who was not familiar with much of the slang that appears throughout the book. It was difficult to go back to this novel because there were so many bad memories attached but I was finally able to appreciate what others liked about it and, most importantly, I was able to laugh at how silly the main character and I were. JM: I am finishing a degree in English and I was shocked by the fact that several younger, heterosexual college students did not know who Matthew Shepard was. I know his murder happened nearly 11 years ago now, but it still seems current to me. We are still trying to pass a national hate crimes law named after him. Is our current culture more accepting of queer people, but more ignorant about queer history? Am I just being an old queen? JM: How do you feel that queer culture has changed in the past decade? EM: There has been a lot of progress but we still have to fight for the same basic rights everyone else gets to enjoy. It is ridiculous that we have to fight for a piece of paper that grants us the same rights of marriage because the church gets involved. Many foreign countries and Massachusetts have had gay marriages for years and they have not burnt to the ground. Nobody can force any priest to marry them, even heterosexual couples. In addition, the whole “What’s next? People marrying animals?” has been reduced to an eye-roll for anyone with half a brain. Ten years ago, these arguments may have been considered but today the smell of equality is in the air. JM: What about the queer arts and literature? What have you seen happen in the past ten years with queer writing and publishing? EM: Well, unless you are fortunate enough to be Augusten Burroughs or David Sedaris, both of whom I love, it is still pretty much the same. Ten years ago, many small presses and queer bookstores were going belly up thanks to the economy and, funny enough, that is where we are today. There is more opportunity to sell with online purchases and Kindle but there are fewer spaces for queer authors to gather comfortably and enjoy book signings and readings with their audiences. JM: You have edited two collections of poetry, Bullets & Butterflies: Queer Spoken Word Poetry and Mariposas: A Modern Anthology of Queer Latino Poetry . What is it like editing an anthology vs. putting together a collection of your own work? How has your experience as an editor shaped your own writing? EM: Both were poetry anthologies so they were much easier to publish than putting out my own collections. You do not mess with another poets work. Either you like it or you don’t. If you do, you might make simple corrections but you don’t go through it with a red pen. Everything, including the line breaks, is crucial to a poet so, if you choose to publish it in an anthology, you make sure their voice is being heard load and clear. Putting together your own collection is different because it’s your work and you could edit and make changes as you see fit. You are also piecing the book together so that there is a flow. Both are exciting and I look forward to doing more of each. JM: I know that you are doing readings for your new book and signings, but what else are you working on at the moment? to complete that project. I am also curating a literary series at El Museo Del Barrio this fall. JM: Is there anything else you would like to say? EM: Yeah, this has been a long interview and you’ve really made me think! (Laughter) I’m just glad I’m still around and hope someone out there finds some inspiration in any of this. Inspiring interview! and great to get a poem here, too. Thanks!